Satnews Daily provides you with a comprehensive and timely summary of important news within the global satellite industry. Available online as well as in your inbox, news that's of interest to you is offered, whether such covers a particular topic of interest, or news that is important to your region of the world. If you seek a more concise summary of the most critical news in the industry consider subscribing to Satnews Weekly. Delivered each Monday to your inbox this weekly summary highlights the 10 most critical stories of the week, week as well as highlighting important upcoming satellite events. SatMagazine is available for online consumption or to download for reading at a more convenient time. 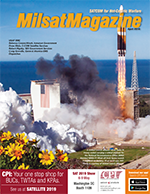 Focused on commercial areas, the magazine provide monthly features, trends, market analysis and recent developments in international satellite communications. Get monthly release updates by visiting our subscription page.